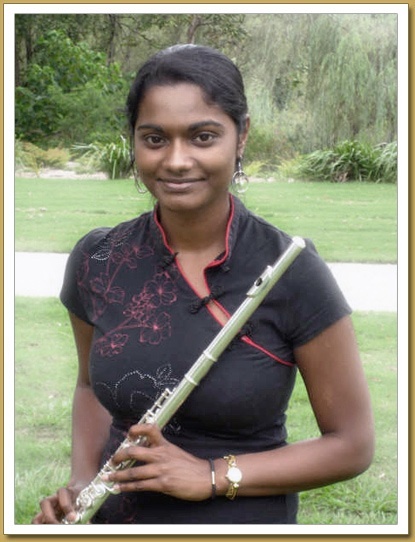 Sophie Manoharan completed her Bachelor of Music (Performance) with first class Honours at the University of Queensland in 2008, where she studied flute performance under the tuition of Jeanette Manricks. Throughout her time at university, she has played with the UQ Symphony Orchestra, the UQ Symphonic Wind Ensemble, the Brisbane Philharmonic Orchestra, the Mueller International Chamber Orchestra, St Andrew's Sinfonia, the Queensland Wind Orchestra, as well as chamber ensembles including wind quintets, string quartets, flute and guitar, flute and harp, flute and piano duos, and as a soloist. Sophie enjoys performing in a wide variety of styles including classical, jazz and popular music and has a strong interest in chamber music. Sophie has been the recipient of many awards and prizes. She was awarded her Licentiate Diploma in Flute from the Australian Music Examinations Board with Distinction in 2009, and holds her Associate Diploma in Music in flute performance. She has performed in musical examinations, competitions and masterclasses with eminent international flautists. She has extensive experience performing at weddings, community functions and events, musicals, recitals and concerts. Sophie has taught at numerous schools in the Brisbane area, and currently enjoys a busy private teaching studio in New Farm. Sophie is nearing the completion of her Master of Philosophy (Music Performance) degree at the University of Queensland.